2,099 2018 batch ‘B’ (stream ll) Corps members deployed to Kaduna and Niger States by National Youth Service Corps (NYSC) on Thursday sworn-in to undergo 21-day orientation course at the scheme’s permanent orientation camp located at kilometer 16, Kaduna-Abuja highway. The orientation course is the first of four cardinal objectives of NYSC. Others are place of primary assignment (PPA) community development service (CDS) and passing out parade (PoP) that signify end of the service year. 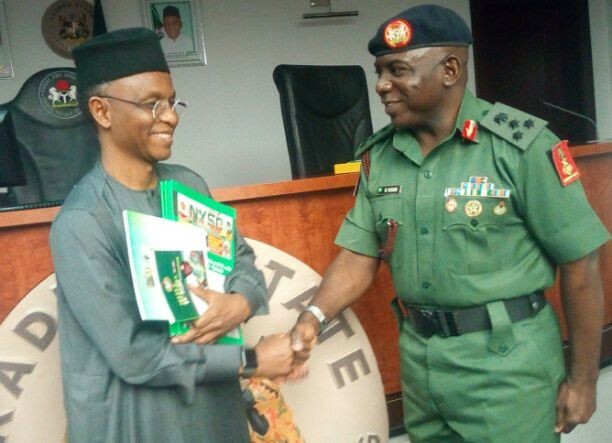 Declaring the orientation open, Kaduna State Governor, Nasir El-Rufai noted that, the scheme has in the past 45 years of its establishment remained a beacon of hope in Nigeria’s enduring quest to become a united nation. El-Rufai, who was represented at the swearing-in ceremony by his deputy, Arch. Yusuf Barnabas Bantex appreciated the scheme for always supporting the state in the area of manpower especially in educational and agricultural sectors of the state’s economy. The governor used the event to reiterate the commitment of his administration to do all within available resources to support the NYSC by providing enabling environment for effective discharge of its mandate in the state saying, steps were being taken to ensure immediate completion of work on the camp parade pavilion and other vital orientation course facilities, aiming at enhancing smooth induction of successive Corps members deployed to the State. He then reassured the corps members of their safety as the state government was resolutely committed to the security and well-being of all citizens including NYSC members deployed to the State for the one year mandatory service to motherland. Admonishing the corps members, Director General of NYSC, Brigadier General Suleiman Kazaure urged them to take every part of orientation activities very serious especially the Skill Acquisition and Entrepreneurial Development which was designed to make them self-reliant. Earlier, the Coordinator of the Scheme in the State, Hajiya Walida Siddique Is a reminded the corps members that, life in the orientation camp was regimented, hence the need for them to abide by the rules and regulations of the scheme throughout the service year.